VANCOUVER, BRITISH COLUMBIA--(Marketwired - Nov. 4, 2016) - Salazar Resources Limited (TSX VENTURE:SRL)(FRANKFURT:CCG) ("Salazar" or the "Company") is pleased to announce the start of the 10,000 metre Phase V drilling program on the Curipamba project, Ecuador. The planned 10,000 meter drill program is designed to further expand the El Domo volcanogenic massive sulphide ("VMS") deposit and explore its margins, as well as to test regional anomalies and showings (Figure 1). Fredy Salazar, President and CEO of Salazar, comments: "We are pleased to be restarting exploration on the Curipamba project to the benefit of Salazar's shareholders. The El Domo deposit is a significant discovery and Salazar believes the size of the deposit can be increased through diamond drilling. 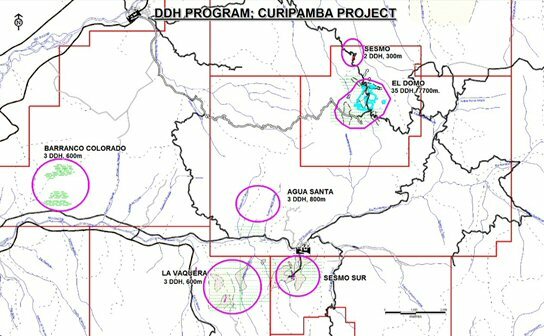 The Phase V drill program will be focused on extending the El Domo deposit but will also test a number of high potential geophysical and geological targets." Salazar has mobilized one of its drill rigs to site and drilling has commenced. The Company anticipates mobilizing its second drill rig in late November or early December. A total of 40 drill holes are planned and the program is anticipated to continue through December 20th, when operations will cease for Christmas break. Drilling will resume on or about January 5th 2017 and continue until late March 2017. Salazar Resources Ltd. is a publicly-listed (TSX VENTURE:SRL) mineral resource company engaged in the exploration and development of new highly prospective areas in Ecuador. Led by a senior Ecuadorian management team and most notably by its namesake Fredy Salazar, this team has been instrumental in other major discoveries throughout Ecuador, including Aurelian's Fruta del Norte discovery, IAMGold's Quimsacocha Deposit, Mozo Deposit, Ex Newmont's Cangrejos Project and International Minerals Rio Blanco and Gaby Deposit. Being an Ecuadorian based company gives the Company a strategic advantage enabling the Company to complete exploration at a rapid pace. With an excellent property portfolio (4 projects - 151,000 hectares), good geopolitical positioning and a number of strategic corporate and financial partnerships, Salazar has positioned itself to be a strategic player in Ecuador. This press release contains "forward -looking information" within the meaning of applicable Canadian securities laws. All statements included herein, other than statements of historical fact, are forward-looking information and such information involves various risks and uncertainties. Forward-looking information herein includes, but is not limited to, statements that address activities, events or developments that the Company expects or anticipates will or may occur in the future, including such things as the execution of the Phase V drilling program. Such forward-looking information is based on a number of material factors and assumptions. Although the Company has attempted to identify important factors that could cause actual actions, events or results to differ materially from those described in forward-looking information, there may be other factors that cause actions, events or results not to be as anticipated, estimated or intended. There can be no assurance that such information will prove to be accurate, and actual results and future events could differ materially from those anticipated in such information. A description of assumptions used to develop such forward-looking information and a description of risk factors that may cause actual results to differ materially from forward-looking information can be found in the Company's disclosure documents on the SEDAR website at www.sedar.com. Accordingly, readers should not place undue reliance on forward -looking information. The Company does not undertake to update any forward-looking information except in accordance with applicable securities laws.